I just fell in love when I saw the idea for the button heart on Southern Lovely. I just knew I needed to make one for my own Valentine decor. I was trying not to go too Valentine-y with the colors because I wanted to keep it up all year long. I used an 8×10 canvas for this project. I got a pack of 10 at Micheal’s a while ago and have just started using them. Of course I used my “Handy Dandy” 40% off when I got them!! I also stocked up on some buttons while I was there. First, I painted my canvas white. Once the paint was dry, I taped off the stripes with regular painters tape (I LOVE that stuff). Side Note: Do you like creating something new from something older? If so, I TOTALLY remade this button heart in to a Christmas tree! I used Martha Stewart’s Holly Berry for the red strips. It has a little metallic/pearl effect to it. 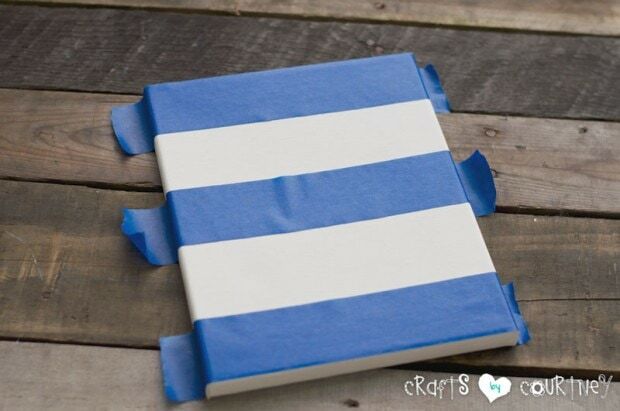 Once I painted the stripes, I pulled the tape off immediately. There were a couple button options. I was thinking darker blue so that it could go with July 4th as well. Yellow looked really nice against the red. But in the end, the light blue and aqua looked the best to me. 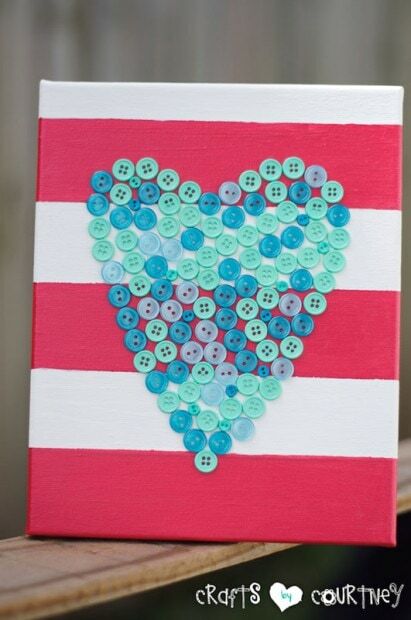 Quick Tip: It helps laying out your buttons on the canvas first and create your heart free handed. Work until you’re satisfied with your heart shape. Once I had my heart shape, I just picked up each button and glued it down with craft glue. It took about 10 minutes total. This heart fit perfectly with my Valentine decor. I think buttons have become my new obsession!! 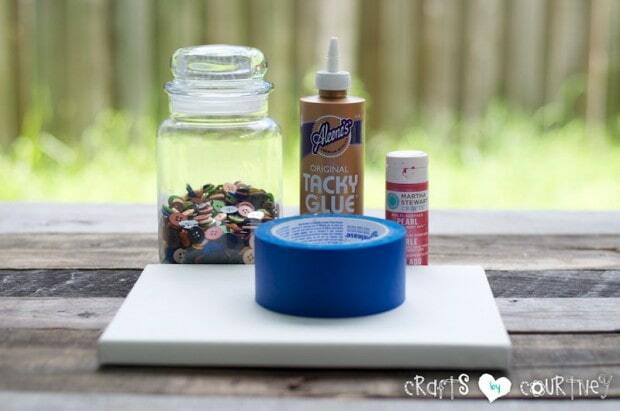 What is a favorite button craft you have?